The Tamil version of the blockbuster Malayalam flick Bangalore Days written by Anjali Menon, has apparently been titled as Arjun Divya Matrum Kannan (ADMK). The interesting abbreviation of the title is bound to grab a lot of eyeballs indeed. 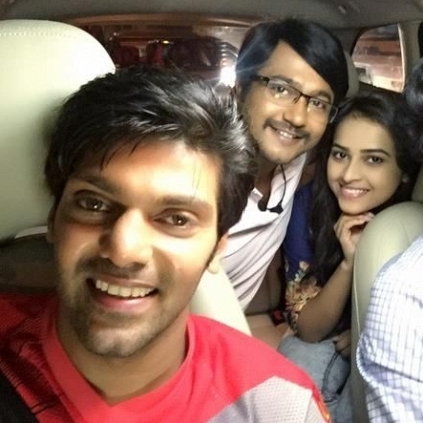 This remake stars Arya, Rana, Simha and Sridivya in the lead roles and is produced by PVP Cinema. Bhaskar directs the remake which is being shot over the past few months in and around Chennai and Bangalore. We can expect the film to release sometime later this year. It must be noted that a Telugu remake is also in the offing. Karthi's noble thought ... Way to go!! Vasuvum Saravananum Onna Padichavanga - VSOP Is Actor Arya's 25th Film Which Will Release On August 14th. Blue Ocean Film And Television Academy Had Its Master Class With Actor Arya On 3rd July. Actor Rana Daggubati Speaks About Thala Ajith In A Recent Interaction With Fans. People looking for online information on ADMK, Arjun Divya Matrum Kannan, Arya, Rana, Simha, Sridivya will find this news story useful.